Iperen Humic is a highly concentrated, soluble source of Potassium Humate processed from leonardite via a unique extraction method. Our product is the most efficient source of Potassium Humate and has prominent abilities in regard to CEC, buffering, chelation and complexation. 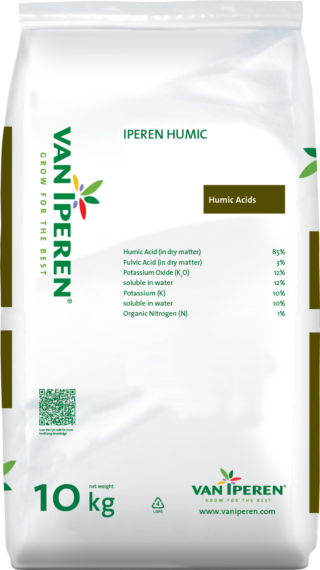 Iperen Humic is recommended in poor soil conditions or when Phosphate application is restricted. The presence of active leonardite (long chain) in our formula has a positive effect on the uptake of Phosphate and micronutrients. Furthermore, it increases Nutrient Use Efficiency (NUE) and reduces leaching. Compatible with other fertilizers, except Phosphate fertilizers. Therefore a separate tank is needed or fertilizers should be applied on different times.